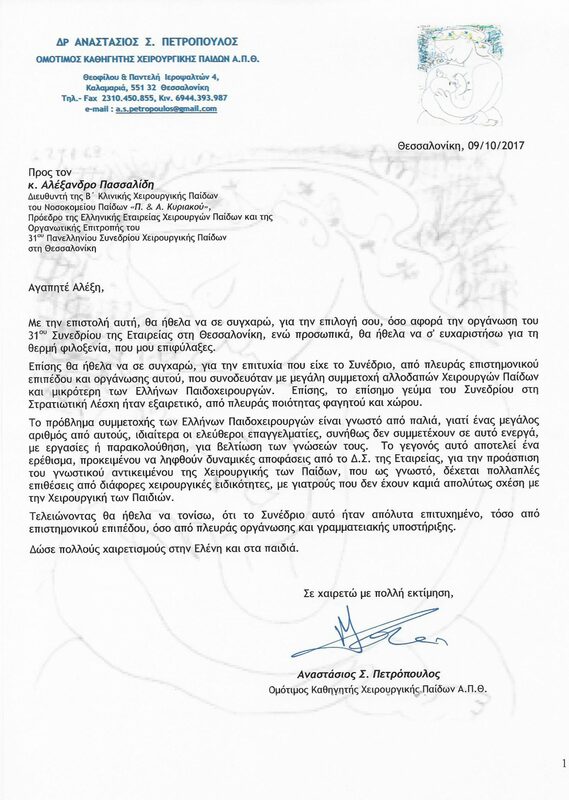 Ομότιμος Καθηγητής Χειρουργικής Παίδων Α.Π.Θ. thanks once again for your kind invitation to Thessaloniki. You did an inmense ammount of work to organize everything and it was great. I hope you are not sad about the low response of local collegues, they missed a great metting. And every single collegue we reach is worth the work. I would like to thank you once again for your kind invitation to the 31st PanHellenic Congress of Pediatric Surgery and organising a very successfull Scientific Meeting. I’m looking forward to our future scientific and social collaboration. You are always welcome in Istanbul. Thanks for your efforts for inviting us and trying to organize a successful meeting for GAPS and other colleagues as well. Went to airport and payed a very reasonable taxi fee.I went for check in. Couple of minutes later the driver came again and gave me back the money and told me that everything will be paid by the congess organization. I was surprized very much. Δείτε το πρόγραμμα και το υλικό του συνεδρίου εδώ.